When I first started teaching, I changed bulletin boards monthly – always with, what I perceived was a “cute” theme. Laminated cutouts, tracings from an overhead projector…. I diligently changed the boards in my classroom to reflect seasons and my own idea of what would make the classroom seem cute or homey. Oh boy, have things changed! Next Tuesday, when my students enter our shared space for the first time since last June, those cute, decorative, perfect bulletin boards will be missing in action. Why? Several reasons. 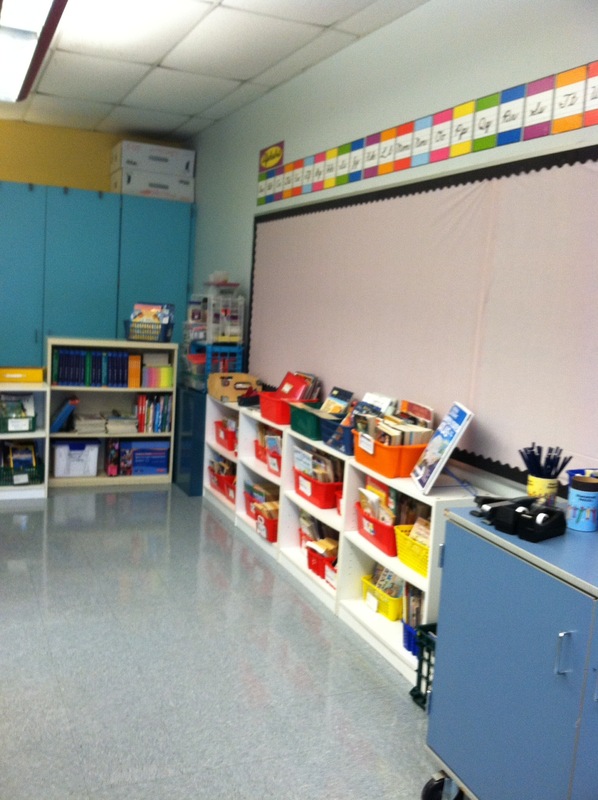 Over time, I’ve recognized that the perfect, teacher-created bulletin boards can create a dizzying space. While I don’t want the walls to be institutionally devoid of anything, there is a balance needed. Kids don’t need to have more stuff to distract them. So, mainly anything I put on the walls is necessary as a reminder (example: Daily Five I-Charts) and mostly co-created with my kids. Now I use one color for a background throughout the classroom. Following Gail Boushey and Joan Moser’s lead (the “2 Sisters“), I use a very light pink which is easy on the eyes and not a distraction from what will end up on those boards. Putting up backgrounds is tedious, measuring, pulling the material taut and stapling it to the ugly grey material of the board takes lots of time. When I used to use construction paper, it would fade very quickly. So for the last several years, I’ve “invested” in plastic table cloths from our local party store. This material doesn’t fade, stays up, and staple/pin holes are pretty minimal. And they are inexpensive. Sweet! Similarly, I use a border that stays in the background, but ties all of the display areas together cohesively. The black border that I have chosen is a simple, corrugated, plain border which just happens to be reasonably inexpensive. As you can see, outside of the bare bones of what will become our CAFE board and an alphabet strip, the boards are bare and ready for the students and me to begin creating essential reminders of what we are learning or student work. We are (almost) ready for the first day.